Cisco had been injured on a ride several hours away, and had already been seen by the local vet. But a few weeks of foot soaking, poultices and pain medication had passed with no improvement, and Michelle was getting frustrated. I put my hoof testers on Cisco’s hind foot. I wasn’t expecting any reaction, as my colleague had reported a negative hoof test. But when I squeezed across the frog, Cisco jerked the foot violently. When Michelle walked Cisco down the aisle, he walked on his toe, reluctant to put the sore heel down. She spoke as I was about to share my findings. Cisco’s unshod hind feet were immaculately trimmed and balanced, plus I’d already checked his back and hind legs. 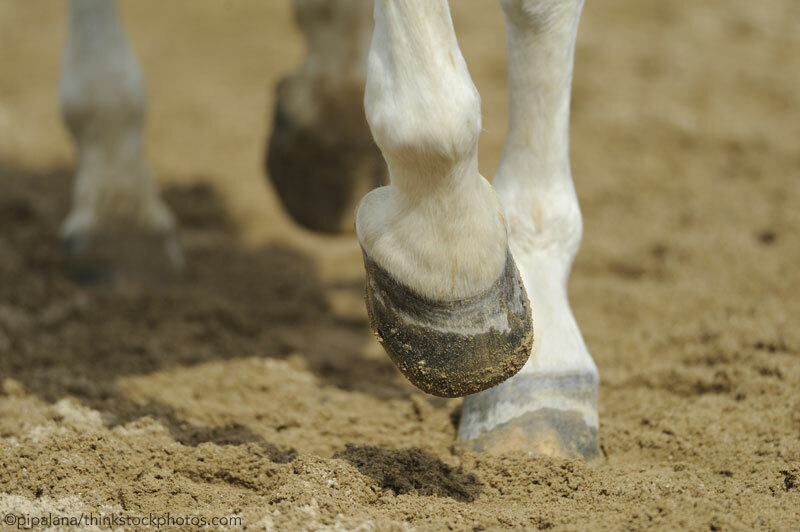 The previous vet’s nerve block and my hoof tester exam had definitively localized the pain to the foot. “My trainer was here yesterday. She found that he flinched right here and said that this was the problem. See?” She stubbed a finger several times firmly into the side of Cisco’s lower back, and he flinched rhythmically with her prodding. My phone rang. Apologizing, I walked down the aisle and answered. A loud flood of expletives poured through my phone, and chuckling, I held it far away from my ear. Ritchie and I were old buddies, and I was used to this. When I could get a word in edgewise, I agreed that the problem was in the heels. There was a growl of assent and Ritchie clicked off. I was returning to the horse, when the line rang again. This time it was Vanessa. “No, it’s his back!” she fumed. “Because bad angles cause back pain! Everyone knows that!” she spat. “Vanessa, I have to go now. Thanks for the call.” I hung up quickly and turned off the ringer. I returned to Cisco and the owner was still rhythmically prodding his spine and he was still rhythmically flinching. “See? See? His back hurts! His back hurts!” she chanted. “Michelle, look.” I started prodding Cisco firmly from his poll to his rump. He flinched in time with my poking, and shot me a look of deep annoyance. I patted his neck gently but he turned his head away. Michelle argued weakly for a few minutes but she was losing momentum. For good measure, I pointed out the excellent conformation of Cisco’s feet and the utter amazingness of his angles, and she crumbled. I X-rayed the foot again to make sure we weren’t missing anything, and soon Ritchie was backing his big truck up to the barn and had expertly hand-forged a special shoe for the horse to protect his sore heels. After nailing the shoe on, he packed the sole with soft material to further cushion the foot. Michelle led Cisco down the aisle, and he walked happily beside her. He was completely sound. “Ritchie, should I work on his back, do you think?” I asked politely. More expletives came from Ritchie’s direction as he packed up his tools. I’d never seen a farrier throw a 125-pound anvil before, but his flew into the back of his truck as though it were made of aluminum. A few more thumps and crashes, and Ritchie was packed up. He smooched me loudly on the cheek, growled in Michelle’s direction and gave Cisco a head rub before leaping into his truck and pulling away from the barn. Two weeks later I was back at the barn to see another horse, and Vanessa was working away busily on Cisco’s back, waving a black wand up and down the horse’s spine and applying aromatic oils to his hips and withers. She glared as Michelle scuttled up to me. I aimed an extra-large smile in Vanessa’s direction, and left, delighted to see Ritchie’s truck rumbling up the drive. I happened to know that he was making a quick stop to recheck Cisco, and as tempting as it was to return for the show, I waved innocently and drove on. My phone rang 10 minutes later. I was laughing too hard to answer. Ritchie promised several kinds of revenge, and I knew he’d follow through, but it was well worth it. Plus, Cisco was doing well, and that was really all that mattered. COURTNEY S. DIEHL, DVM, has been an equine veterinarian since 2000. She resides in Steamboat Springs, Colo., where she is in private practice. Her first book, Horse Vet, Chronicles of a Mobile Veterinarian, was published in 2014. She is currently at work on her second book.